Depending on the type of fire that occurred in your home, depends on the type of rebuilding you can do. Our reconstruction team walks you through, what and how we can help you rebuild after a fire damage. We want to first make sure the damages that were done by the fire do not get worse. We want to seal off any parts of the home that are exposed or had severe smoke or soot damage that needs to be sealed off from other rooms. When smoke and soot get into your home during the fire --it can create massive amounts of smoke and soot damage. Anything that can hold smell will hold those odors. We have extensive cleaning services and soft contents machinery to clean your smoke or soot damaged items. Most fire damages are not a complete loss. Usually, a few parts of a home are damaged and need repairs. We have a reconstruction division who can help chose flooring, wall installations, and other necessities for home repair. It can be overwhelming after your home has a fire, smoke, or soot damage. We assure quality and sensitivity when it comes to your beloved items and family home. Call us today for a consultation. When you business hits a certain mark, updates are a natural occurrence. You may not have had any kind of damages to the building, but you want to update it to make your customers needs and wants. Our reconstruction division can help you get the upgrades you need. We have access to the best in flooring, paint, drywall, and fixtures that could get your business to the next level. We can get you the best prices for the best quality. We treat our customers like family, and we want better for your business. When it comes to reconstruction you want someone you trust to help you rebuild, or revamp. SERVPRO® of Pulaski and Laurel Counties reconstruction division is here to help! Our team is ready to get you the business of your dreams. To live in perfect harmony with your pets, call us today for those pet odor issues! 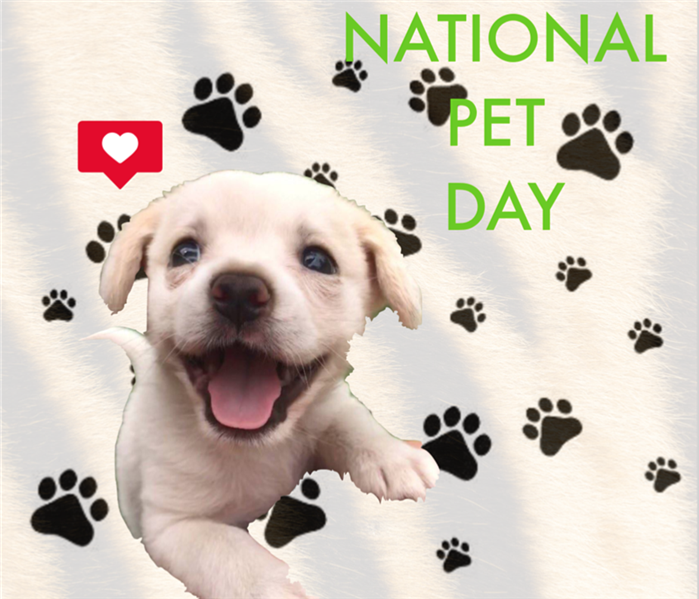 If there is one thing we can all agree on it is that we love our pets. From the fuzzy ones to the feathery ones, they are all a man's best friend! The only downside to our furry friends are the dirt and odors they leave behind. We get several calls a week about customers trying to get cat urine and dog feces out of carpets. Our technicians are trained to get pet odors and dirt out of carpets and other flooring. Another service that helps get those pet odors out of homes is getting your HVAC cleaned. We have equipment and disinfectants to get those odors out of your air duct systems too. We want you and your pets to live peacefully together. If you have pet odor or dirt that needs to be cleaned, call the professionals, SERVPRO® of Pulaski and Laurel Counties today. When arranging work to be done in your home, wouldn't it be nice to only depend on one team to put your home back together? We have been your water damage cleanup specialists for years now, but did you know SERVPRO also does reconstruction? When water damage happens to your home and especially in your bathroom, it can make putting your home back together seem tedious. You can get your old bathroom back, or we can help with updates to your home! SERVPRO® of Pulaski and Laurel Counties can help. We're talking about heated bathroom flooring. Our reconstruction team can help you. We want your home to be back to even better than it was before the water damage occurred. It's always better to go from wet floors to heated floors. When your home or business is impacted by fire damage, all you can think about is how to make that home or business back to "Like it never even happened." We have new solutions for you. We are talking about upgrades. We have a reconstruction division that specializes in getting your home or business the newest windows, flooring, and finishes for the best prices. There's a new type of windows to consider after dealing with a fire, smoke, or soot damage: double- hung windows. They are easy to clean on both the top and bottom and the sashes will open and tilt inside for even better cleaning. After a fire damage getting the smoke and soot off the windows is one of the first priority. With these new features --it makes it faster and easier to clean. Another upside to these windows besides being efficient for cleaning is they are energy efficient, and the seals are less likely to break. Most of these types of windows even have a glazing, so it makes it harder to see inside of your home during the day and blocks heat from entering. Not only do these windows have several new features, but they can be done in just a few short hours, if they stay the same size. Another feature of our reconstruction division is you do not have to have damages to your home to get in touch with SERVPRO on upgrading your home. We can do upgrades and reconstruction without water or fire damage occurring. Call us today at 606-877-2160. When you check your home for rainy season mishaps, be sure to keep SERVPRO® of Pulaski & Laurel Counties in mind. You want to have your home in the best care. We are the professional heroes who can make your water damage "Like it never even happened." These pretty icicles turn into pretty ugly water damage! During the winter time, there a variety of winter weather conditions that can alter your home or business. One type of damaging winter weather types is an ice dam. Ice dams are what happen when melted snow freezes at the bottom of your roof and melted water gets trapped by ice. 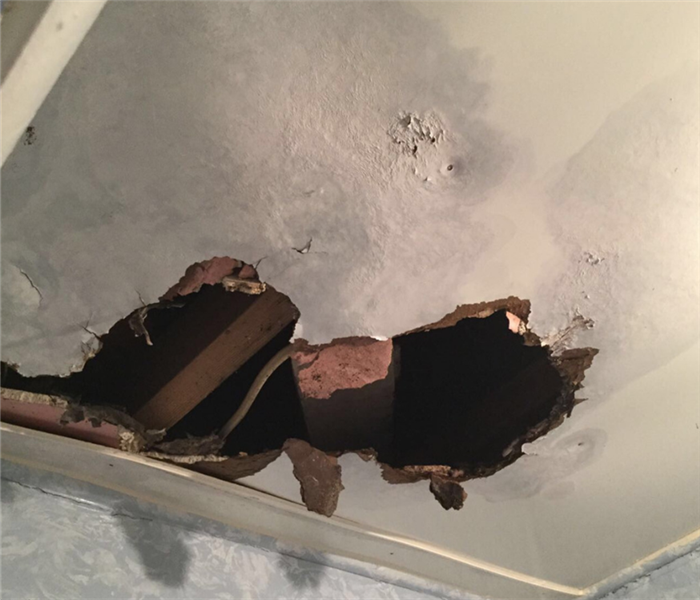 The water damage occurs on your roof and finds it's way into your attic or other parts of your home. fix cracks in your chimney flashing. 1. Steer clear of removing ice with salt, chemicals or chippers. 2. Do NOT install heating cable. 3. Do NOT add roof vents that can compound the problem. Use these tips in your home or business to successfully avoid water or ice damage. We hope you do not have to deal with ice dams or water damage in your home, but sometimes nature causes damage no matter what we do. If you do need water damage remediation --please do not hesitate to call us! Reach SERVPRO® of Pulaski and Laurel Counties at 606-877-2160. We'll keep you from filing that claim! Don't let finances stop you from getting your home back to "Like it never even happened" condition. Water or fire damages come when you least expect them. The one thing to always help that is insurance. But, what happens when you do not want to file that insurance claim but you still need a cleanup crew. SERVPRO® of Pulaski and Laurel Counties offers financing. We have a financing program to help you out in your time of need. We know that your deductible could be high, your insurance might not cover this claim, or you could want to keep your rates down and not file a claim at all. Now is the time to call us! We have this option available because we know our customers need us and emergencies do not wait for finances to be perfect. We are here to help! We have partnered with Blue Sky to help you and financial needs. Call our offices today to get more information on our financing options. Classes of Water: How do they add up? 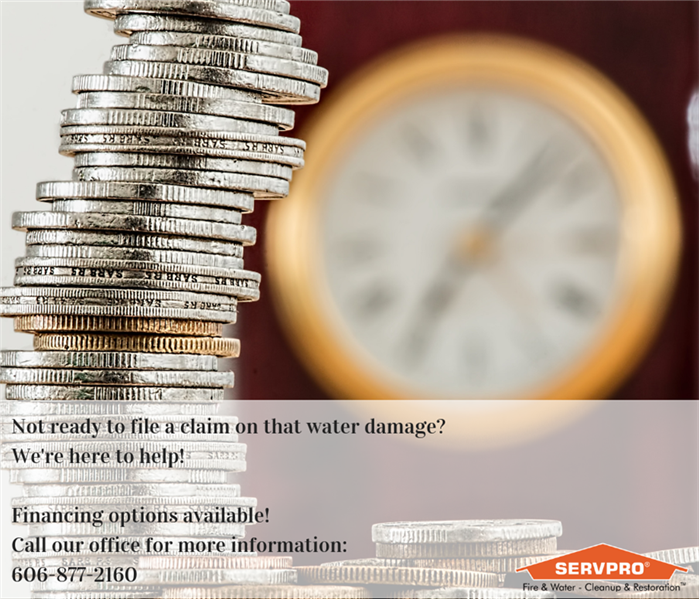 In water damage, there are a variety of factors that impact pricing, damage control, insurance, and other aspects. The classes of water can be broken up into four different categories. This is when there is only a bit of water, absorption, and evaporation. It means that a portion of a room or area is impacted. It can also refer to a larger area where the wet materials have absorbed moisture minimally. Little or no wet carpet or cushion is present in Class 1 Waters. This involves a large amount of water, absorption, and evaporation. We use this classification when the entire room with carpet and pad is affected. There is moisture in structural materials and substructure soil. This type involves the greatest amount of water, absorption, and evaporation. Water in this class may have come from overhead. Ceilings, walls, insulation, carpet, cushion, and sub-floor in virtually the entire area are saturated. This kind relates to specialty drying situations, such as wet materials with low permanence or porosity. These types of losses may require longer drying times and specialty drying methods. If you have water damage, whichever the class may be, call SERVPRO® of Pulaski and Laurel Counties today! When it comes to water damage look no further than your LOCAL SERVPRO® of Pulaski and Laurel Counties. We are proud to serve our local communities, call us today 606-877-2160. We are here to help 365- 24/7. When you call, we anwser. We want to make you water and fire damages "Like it never even happened." 12/3/2018 - We'll keep you from filing that claim! 11/27/2018 - Classes of Water: How do they add up?